Since the formation of ALIEN ANT FARM in 1995, the quartet has enjoyed worldwide success, selling over five million records over the course of their three album releases, a Grammy and AMA nomination along with a number of #1 and top 10 singles to date. Having just released their brand new single, "Homage", via Executive Music / The End Records, the group is thrilled to announce that they’ll be heading back out on the road for the second leg of their ANTarchy In The USA Tour in the US this fall. All tickets are on sale now! From the beginning, the clever humor of vocalist Dryden Mitchell and guitarist Terry Corso has delivered visual imagery that made the band vanguards in the realm of music video. All of the singles released received heavy rotation on MTV and MTV2, with "Smooth Criminal" voted as the #2 video of 2001 on MTV's countdown. They appeared on the channel's programs Celebrity Dismissed, MTV Cribbs and hosted an episode of House Of Style. Alongside the massive support from cable, ALIEN ANT FARM were darlings of broadcast television with multiple appearances on The Tonight Show With Jay Leno, and support from Carson Daly, Extra, CNN, Access Hollywood and Mad-TV amongst many more. With all the notoriety also came a 2001 Grammy nomination for Best Hard Rock Performance in 2001. 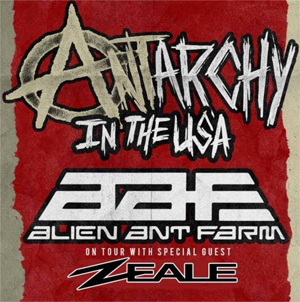 Come 2014 ALIEN ANT FARM are back, and the path for the future will unfold one day at a time. As their career approaches two decades, Guitarist Corso offers, " Although we spent a couple of years quiet, there is no denying the chemistry when we all get back into a room and on the road together. The band, the show, and the songs are just better when we are all together and have a fresh outlook on how we want to get back and give back to our fans.” Drummer Cosgrove echoes, "It's good to be back in the swing of things with getting new music out and back on the road in front of those who have supported us for so long and to meet new fans that might have just been turned onto ALIEN ANT FARM.” With strong repertoire, great attitudes, and a fan base that has been there every step of the way, the future is lining up nicely for ALIEN ANT FARM.